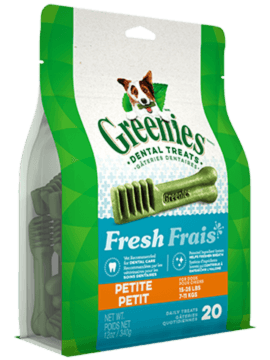 Kiss bad dog breath goodbye with these GREENIES™ Dental Dog Treats! 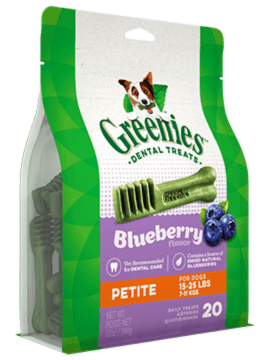 Your dog can’t wait to sink their teeth into these delicious senior dog treats that have a 50% softer texture* that gently cleans teeth down to the gumline. 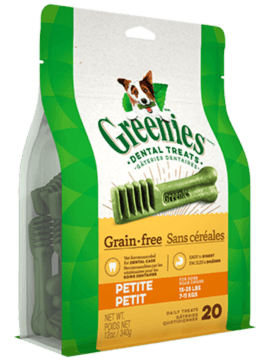 Irresistibly tasty, GREENIES™ Treats for Dogs are recommended by veterinarians for at-home oral care. These yummy treats are made with natural, easy-to-digest ingredients, plus vitamins, minerals, nutrients, and antioxidants for immune support. 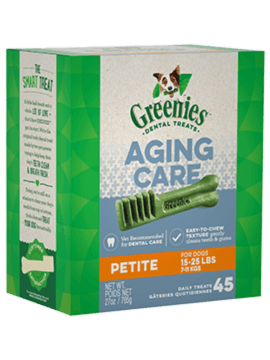 GREENIES™ Aging Care treats help maintain a lifetime of healthy joints for your senior dog. Formulated with glucosamine, GREENIES™ Treats are the best senior dog treat for mouth-wowing, teeth-cleaning, grin-inducing moments with your dog. Wheat gluten, glycerin, wheat flour, gelatin, water, powdered cellulose, fish oil (preserved with mixed tocopherols), lecithin, dried chicken cartilage, minerals, (dicalcium phosphate, potassium chloride, calcium carbonate, magnesium amino acid chelate, zinc amino acid chelate, iron amino acid chelate, copper amino acid chelate, manganese amino acid chelate, selenium, potassium iodide), dried new zealand green mussel, natural poultry flavor, taurine, vitamins (l-ascorbyl-2-polyphosphate, dl-alpha tocopherol acetate [source of vitamin E], vitamin B12 supplement, d-calcium pantothenate [vitamin B5], niacin supplement, riboflavin supplement [vitamin B2], vitamin A supplement, vitamin D3 supplement, biotin, thiamine mononitrate [vitamin B1], pyridoxine hydrochloride [vitamin B6], folic acid), DL methionine, choline chloride, fruit juice color, decaffeinated green tea extract, turmeric color. Feed one GREENIES™ Dental Chew per day. Not suitable for dogs less than 5 lbs, or dogs less than 6 months of age. Fresh drinking water should always be available.